**Updated 1/15/12** See Changelog section for details. seeks to fix this little oversight. 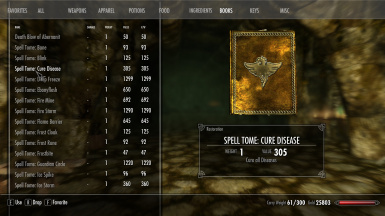 SBMS adds a few spells and makes a host of tweaks to balance the magic system in Skyrim. to reflect some of the changes. move on to the changes section below. elemental fury, or any of the other ways damage can be increased. stats are at 100. Magic also burns through the resource you need to use it too fast. again if a player so wishes. Greatly increase the potency of the existing Master level destruction spells. Increase the duration of several utility spells. Increase the Duration of Dragonhide. Increase the potency of the flesh spells. Increase the armor provided by ward spells. The wall spells now actually do 50 points of damage. in line with the new enchantments. Morokei now has the shout recharge reduction it was supposed to have in the first place. Added 15 new spells (mostly destruction) and placed them in the merchants leveled lists. normally sell a spell of the level you are looking for, and the spell should be there. Fire Blast (Destruction Master) - 90 points of fire damage. Explodes. Deep Freeze (Destruction Master) - 90 Points of frost damage. Moves like Ice Storm. Flame Mine (Destruction Expert) - 120 point mine. Frost Mine (Destruction Expert) - 120 point mine. Thunder Mine (Destruction Expert) - 120 point mine. Cure Disease (Restoration Adept) - Cure Diseases. Screen (Alteration Apprentice) - Increase Magic Resistance by 20 for 60 Seconds. Force Field (Alteration Expert) - Increase Magic Resistance by 35 for 60 Seconds. 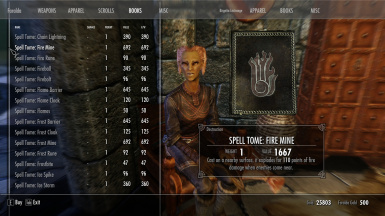 Some users are reporting that their game crashes when they learn a mine spell, and then access their magic menu. It's a standard esp with no additional files. Just drop it in your data folder and enjoy. 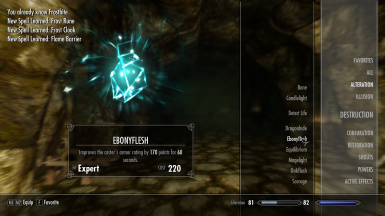 I have included a new spells only esp as well as an esp that keeps the new spells and all the changes I made directly to spells, but does not keep the rest of the changes. Choose only 1 ESP. Decreased the base damage of Firestorm and Lightningstorm, increased the power of Blizzard. Fixed some casting time issues on a few spells. Assigned Torchlight the proper mastery and increased its duration. Restored Fire Storm's casting animation. Fixed an Issue where Bane and Scourge did not have a visible projectile.